On Friday October 19, Dutch record company Armada Music invites all clubbers to get a taste of the label with the official Armada Night ADE special taking place at the Passenger Terminal. Hosted by ALDA Events and with some of its biggest names on the line-up, the event is sure to be a big one. The Amsterdam Dance Event doesn’t only attract thousands of clubbers and music addicts from all across the globe, but also brings together the most prominent names in the industry. DJs, label owners and representatives head over to Holland’s capital to do business and see some of the most prominent acts and DJs perform. An Amsterdam Dance Event household name, Armin van Buuren makes up to his Dutch fans with a set at the Passenger Terminal. Egyptian duo Aly & Fila and Irish number one DJ John O’Callaghan will bring a unique back to back set, as well as Dutchman Sied van Riel and Canada’s Max Graham. Young talents Ashley Wallbridge and Tom Fall will be battling behind the decks as well, each showcasing their sound. 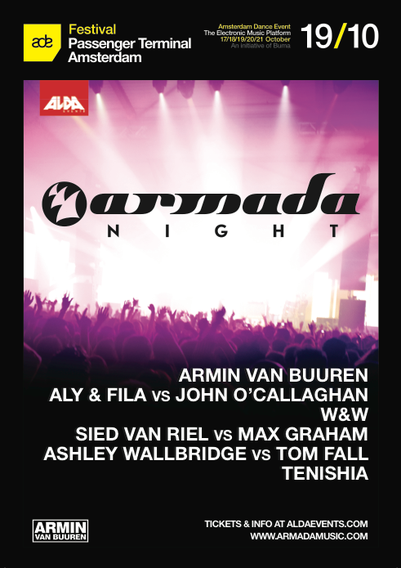 Tenishia and one of the fastest rising duos of the moment, W&W, will play too. For more info check out www.armadamusic.com. Aw, this was an incredibly nice post. Finding the time and actual effort to generate a very good article� but what can I say� I procrastinate a whole lot and don't seem to get anything done.